How lack of exercise affects physical fitness of older adults is manifested negatively in health, strength and flexibility. While there are many different reasons why people tend to slow down and become more sedentary with age, it is important to commit to a regular exercise routine in addition to a balanced diet as you age. Some people stop exercising due to health problems, pain issues, and worries about falling, tripping, and breaking bones. However, it is important to note that an active lifestyle is even more vital than ever to your health as you grow older. If these are your concerns, enroll in a seniors fitness program in Canton, MA. This allows for exercise in a program that best fits the needs of seniors, taking into consideration fitness goals and physical limitations, and in return helps aging adults stay fit and healthy. Staying active through regular exercise can do wonders to your body. It helps boost your energy, maintain your independence, keep you away from pain and illness, and most of all protect your heart. Many older develop illnesses associated with a sedentary lifestyle. Regular exercise with a certified personal trainer is also good for your mind, mood, and memory. With age, keeping the mind healthy is also important. Staying active will help counter these effects so you can be more active but also will have a positive outlook in life. 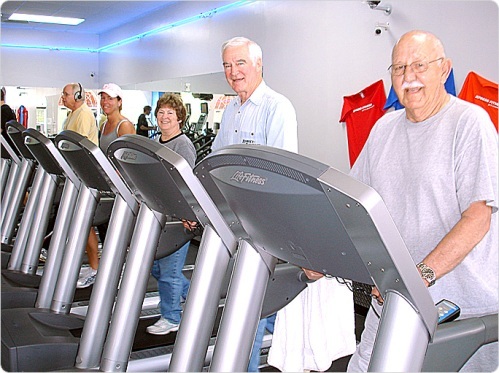 To find out more about Seniors fitness program, contact Answer is Fitness.